The bodHOST Enterprise Cloud is a managed computing platform that empowers you to provision (acquire) computing power and resources dynamically, when required, and pay for only what you actually consume. All computer resources such as CPUs, memory, servers, hard disk storage, networking equipment, databases, firewall, anti-virus software, etc. may be utilized as a service, and paid for by the minute. Your applications in the bodHOST Enterprise Cloud run just as if they were running locally. The bodHOST Cloud becomes an integral part of your enterprise infrastructure, with your Cloud resource pools appearing alongside your internal resource pools. 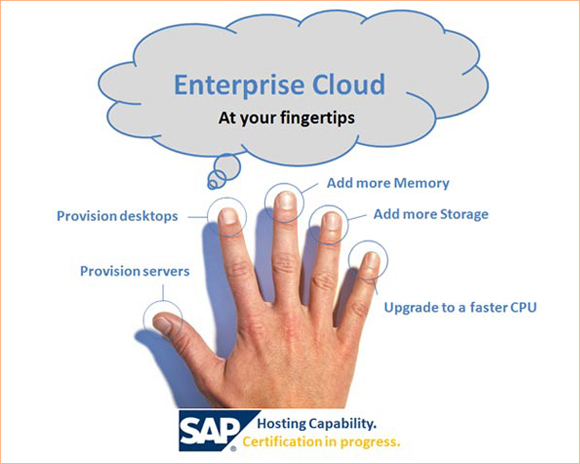 We provide a secure Cloud environment for hosting your SAP and other ERP applications. Certification by SAP is underway and will be concluded shortly. Easy migration of your Windows and Linux applications into the bodHOST Enterprise Cloud. You may provision, start and stop servers at will, either automatically on a scheduled basis, or dynamically in response to conditions. The bodHOST Enterprise Cloud datacenter gives you access to discrete, dedicated pools of compute resources established on exceptionally reliable and highly scalable computing architecture. (a) bodHOST provides the eNlight architecture based on the industry-standard XEN cloud computing platform that is used by many reputed Cloud providers like Amazon and Rackspace. XEN also powers clouds of many major corporations worldwide, including SAP AG, U.S. Army, Ingersoll Rand/Trane, TD Bank, AmBev, Seattle Childrens' Hospital, SK Telecom, Bechtel Corporation, and 230,000 others. 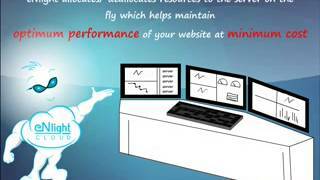 (b) bodHOST also provides Enterprise Cloud based on technology from VMware, the leader in virtual server technology. Customized templates enable you to deploy fully configured servers easily through our user-friendly control panel. You are not constrained by any locked-in processor/memory/storage configurations; you may allocate these to each server as needed, independently of one another. At the heart of the bodHOST Enterprise Cloud is the easy to use management console. With the click of a mouse button you can dynamically provision new servers from a dedicated pool of physical resources, including processing, memory and storage. Select from pre-configured server templates for easy deployment, or customize your own for total control. We provide you with a full reporting interface that gives visual feedback to historical resource allocation and utilization. The bodHOST Enterprise Cloud can be faultlessly incorporated with your own existing private network, thereby providing you with private network integration. bodHOST undertakes the configuration, the address management, and the security issues concerning the interconnections in this hybrid environment. All necessary network connections are achieved exclusively via secure channels that carefully and safely link only subscribed cloud resources to the enterprise network. Should you happen to own a special database server or a device that you absolutely need to maintain along with the Cloud, bodHOST allows you to do that quite seamlessly. The bodHOST Enterprise Cloud may be combined with your dedicated servers and devices, and managed using a uniform web-based interface. It will take you only a few minutes to add this device to your bodHOST Enterprise Cloud, and once a LAN-LAN connection is established, you will have complete control over these dedicated resources. This arrangement and flexibility provides you with the best of both worlds, combining the elasticity of the bodHOST Cloud with the security of dedicated hardware. This ability to integrate physical devices into the bodHOST Enterprise Cloud also helps resolve situations where there may be some kind of a corporate mandate imposed by the Board of Directors about some transaction types never running in a shared environment. The bodHOST Enterprise Clouds are physically located in a top-tier datacenter in Chicago with 17,000 sq. ft. of space. Backup redundancy is provided from multiple data centers in the United Kingdom. A new data center in Los Angeles is soon going to provide redundancy in the United States itself, with a similar facility expected on the east coast shortly – thereby enabling you to create disaster recovery solutions and system redundancy across geographically diverse facilities. The bodHOST Enterprise Cloud web-based console lets you manage multiple environments from a single interface. At the core there is an isolation layer that encompasses your entire cloud deployment. Within this secure envelope, applications and data are encrypted end to end, from inside your firewall, across the Internet, and throughout the bodHOST Enterprise Cloud. Encryption keys are always under your control, and delivered to the cloud inside the envelope only when needed. Around this core, we add the physical security of our data centers, and the most advanced tools, services and instrumentation, managed by experienced and certified security professionals. Cloud Computing 101 provides a more detailed introduction to Clouds.